NEW YORK (CNNMoney) -- Hewlett-Packard couldn't sell many TouchPad tablets for $499. It couldn't even sell them at $399, which is around what they cost to make. But $99? Bingo. That deep discount came only after last week's surprise announcement that HP (HPQ, Fortune 500) is killing the TouchPad. The resulting fire sale, in which HP is selling the tablets for as little as $99 to clear out inventory, has sent TouchPads flying off the shelves. HP has even struggled to keep its inventory alert system online. A company representative told CNN that the sudden demand is "kind of bittersweet." So, $99 tablets are clearly a winner. But HP's TouchPads includes almost $300 worth of components, research firm iSuppli estimates. HP only had the freedom to sell its tablets at a staggering loss because it's throwing in the towel. What about companies looking to stay in the biz? "One of the most revolutionary things about the iPad is its price," says Noah Elkin, mobile analyst at eMarketer. "$499 is still a lot of money, of course, but it's cheap for a device that good and that polished. It's the single biggest challenge for Apple's competitors." Both the TouchPad and Research in Motion's (RIMM) PlayBook launched at $499. Two Android-based tablets -- Samsung's Galaxy Tab and Motorola's (MMI) Xoom -- entered the market even higher, at $599 and $799 respectively. When faced with a choice between an iPad for $499 or another tablet for the same price, consumers are overwhelmingly choosing the iPad. Apple currently holds a 93% share of the tablet market. 'Imminent failure' for Apple rivals? "Miscalculations in price" is a main reason that Forrester Research senior analyst Sarah Rotman Epps is predicting "imminent failure" for non-iPad tablets. In a report earlier this year, Rotman Epps asked consumers: "If you were shopping for a tablet, what features would be important to you?" Each respondent was allowed to choose three answers -- and 65% chose cost. RIP, TouchPad. Can any non-iPad tablet survive -- ever? Most companies would love to price tablets low enough that they'd fly off the shelves and high enough to score a profit. But Apple has two oft-cited, important advantages over its competitors: a lock on the supply chain and its own direct retail channel. "Apple's strength in the supply chain is so far beyond anyone else," says Elkin, the eMarketer analyst. "They've been able to build a beautiful device, sell it for a reasonable price and still make a strong margin -- probably 20% to 30%." And once the tablets are assembled, Apple (AAPL, Fortune 500) enjoys a well-oiled selling machine. "Apple has the ideal distribution model," Rotman Epps wrote in her report. "In addition to selling at Best Buy, Target, Wal-Mart, and carrier stores, Apple owns its own channel. The Apple Store serves as a laboratory for consumers to learn about the device and get support after they've bought it." How low prices may go: The fierce tablet competition among vendors has consumers bargain-hunting. 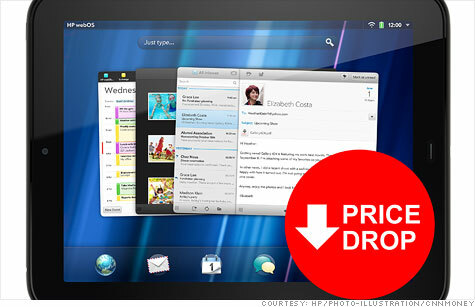 Back in June 2010, consumers said they expected to pay an average of $504 for a tablet, according to Forrester surveys. By January 2011, they expected to pay just $257. "Consumers' perception of tablet cost is shaped as much by the$249 Barnes & Noble Nook Color as it is by the iPad," Rotman Epps says. A $250ish price point is extremely low, and eMarketer analyst Elkin thinks only a few companies will be willing or able to get there. "We'll start seeing stripped-down tablets for $199 or $299 in the coming months, but only less-premium brands will want to put their names on that," Elkin says. "As far as something truly along the lines of the iPad, it will be difficult for almost anyone to undercut Apple." Almost anyone. The only other major company that has both consumer hardware expertise and a wealth of media content is Amazon (AMZN, Fortune 500), which is reportedly working on a tablet expected to debut this fall. "Amazon can sell you the hardware at a lower price because they want to get you buying books and apps and movies," Elkin says. "No other potential [tablet rival] has that kind of leverage." As tablets start their price-tag race to the bottom, the strongest competitors are those who have their hands on every link of the gadget-and-content chain.